One of the first flowers of the new year, the snowdrop is one our most endearing flowers. Not only does it remind us that spring is just around the corner, this delicate bell-shaped flower, has an interesting background. Here’s 10 things you didn’t know about the snowdrop. #1: It’s Greek name ‘Galanthus’, translates as the ‘milk flower’! Known by several different names, it was officially named the Galanthus in 1753, by the Swedish botanist Carl Linnaeus. Hans Christian Andersen wrote a story based on the fate of a snowdrop (short story entitled ‘The Snowdrop’). 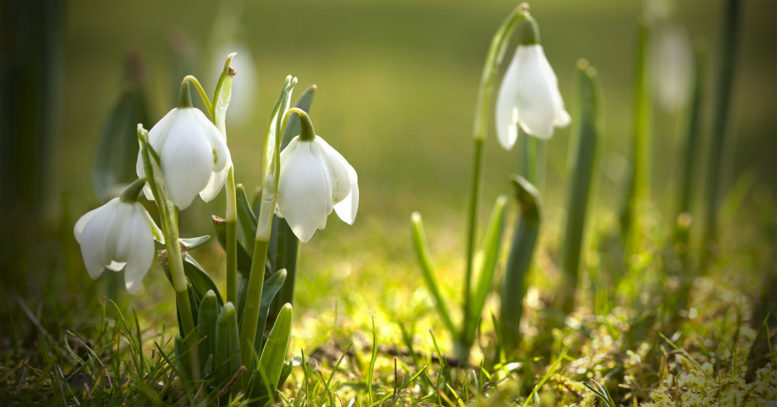 In a poem of the same name, poet Walter de la Mare likened the flower to the Holy Trinity and he also used the snowdrop illustration throughout his poetry. In the northern hemisphere snowdrops can be seen appearing as early as January, weather permitting. They usually flower between the months of January and April. As a carpet of bluebells in woodland is a welcomed sight by many gardeners, so are the snowdrop gardens! Many large gardens open in February, for visitors to witness the snowdrop season. For many, you need a license to sell snowdrop bulbs, as they’re covered by Cites regulations – the Convention on International Trade in Endangered Species of Wild Flora and Fauna. It’s actually illegal to transfer them over borders, without a CITES permit. This is the name given to those who like snowdrops. There’s even regional events, where galanthophiles can buy bulbs for the different varieties. Galantamine is a naturally occurring substance found in the plant. For many Victorians, a single snowdrop signified death and they considered it bad luck to bring one into the home. This could be, in part, due to the bulb of a snowdrop being highly poisonous if eaten. They vary in height from 7cm to 30cm and are divided into approximately 20 species. They became fashionable in the Victorian era but, due to it being known under several different names, no one knows for sure, when they were first introduced to the UK. The first records of plants in the wild date from 1778 – but botanist John Gerard is said to have described the snowdrop in his writings from 1597.